Stevie Nicks always makes me nostalgic, but especially lately, since my 18-year-old son is pretty much done with high school. How does time fly like this?! Congrats to your son! And right on Stevie Nicks! my "baby" will be 25 in September. sure does make me feel old. i clearly remember the days each of my kids were born, just like they were last week. surely not 33, 30, and almost 25 years ago! My favorite song.....it makes me cry every time...but oh so true!!! congrats on your sons graduation!! I know what you mean my baby sister just graduated last sunday from high school. It was kind of scary witnessing that. Congrats on your son's graduation! Great image of Stevie Nicks! Well, I'll beat you, my son will turn 21. Aw, your sone is 18, I bet that is bitter sweet! My oldest is going to be 17 this fall, ah! How did that happen?!!!!! 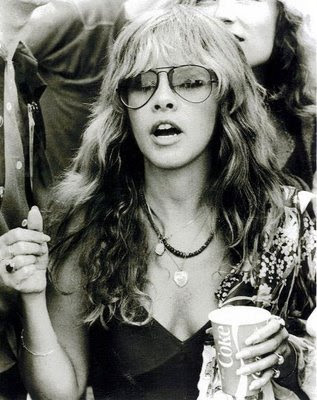 I love Stevie, she so reminds me of my mom!